I finally got around to charting out my whale and waves. 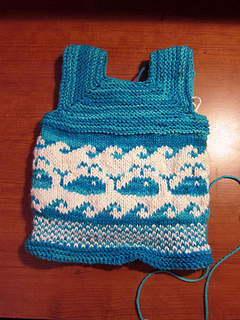 I originally created the chart when I was knitting Milo, a baby shower gift for a good friend. I’ve had a few requests for the pattern, and am now making it available on Ravelry. Enjoy! If you want to use my chart in a pattern, free or otherwise, please let me know and credit me in the pattern. 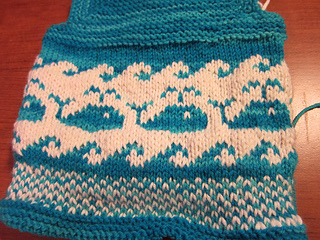 The whale chart is 14 stitches for each repeat. As for height, the whale itself is 14 rows. If you want to include the waves, they are 6 rows each.